Thank you for inviting me for the second year in a row to officially open the Pride Week. Was last year’s speech so good you want an encore, or do I get a second chance? All jokes aside, permit me to pause the celebratory mood for a few moments. I’d like to reflect together with you on the intense public discussions we’ve seen and heard these last few days. I am sure you are all well aware that my decision to be here today was not positively received by all the people in our community . This gave me the opportunity to profoundly reflect on WHY I choose to be here today? The answer to this question comes down to a simple but all-encompassing phrase. So.. Why I am I here? I am here because as a father, a husband, a son, a brother, and most importantly a fellow-citizen, I believe in the dignity of every single person and in the EQUAL right to freedom, prosperity, fulfilment and happiness, for all. I know that I would not be free, if I would have to live in fear of being who I am. So how can I accept that others should live in the shadow, in fear of being who they are, true to the inner self? If I am able to walk down the street, proud of who I am, and proud of who I love, my wife, my family…. then who am I to condemn someone else walking down the street, proud of who they are and proud of who they love? And yes, I am also here as your elected prime minister. Central to my vision as prime minister is the vision of an inclusive Curaçao …where EVERYONE can reach their maximum potential. Building a more inclusive society means leaving no one behind and affirming that everyone has a place in our community and can contribute to the wellbeing and progress of Curaçao. On the day I was elected, I expressed that I would be the prime minister of EVERYBODY. EVERYBODY includes ALL citizens of our dushi Korsou regardless of the colour of their skin, background, income, surroundings, religious beliefs and yes….also sexual orientation. It is my conviction that love is love, and equal is equal, and inclusion therefore means everyone. And that is why I am here today to celebrate pride! The celebration of pride is not about a group imposing their beliefs on other people. Pride is about the right to celebrate the equal dignity and beauty of all people. Pride events around the world are a reminder that sexual diversity exists within the beautiful diversity that makes up our human race. The celebrations, both serious and playful, provide the opportunity to proudly show your existence, uniqueness, diversity and soul as a human being. Pride events are also part of the continuous journey of humanity towards emancipation. Over the last centuries we have liberated ourselves from slavery, oppression, exploitation, and colonialism. Standing up against prejudices and changing an existing order takes time, perseverance, and determination. Various people throughout history, we know their names: Mahatma Ghandi, dr. Martin Luther King, Elizabeth Cady Stanton, and Harvey Milk have made the long arc of the moral universe bend just a bit quicker towards justice. They opened our eyes to the injustices of slavery, colonialism, racial segregation, female inequality, and the prosecution of gay people. When I look at Curaçao, I see a diverse society that has always welcomed and embraced people from all walks of life. I see a society that has walked and is still walking its own path in many ways towards emancipation, with its own hero’s, like Tula and Dr. Moises da Costa Gomez, the known heroes, but also our recent heroes like Mario Kleinmoedig en Alton Paas. Even though the process of emancipation is a long, seemingly infinite road, pride events are a way to honour those who were instrumental to the process of achieving change. These movements for change are often evolutionary, not revolutionary. I also see that as an opportunity for us to engage in necessary debates and to listen and to try to understand each other. I personally believe in showing mutual respect and empathy to even those who oppose my view on things. 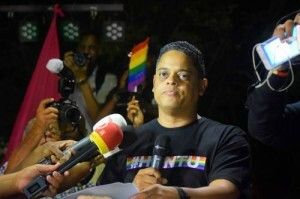 But I must admit that, without decisiveness, vigour, and boldness, the gay cruise ship that some people, including politicians were so heavily opposed to, would never have visited Curaçao a few years ago and that this march today, through our beautiful town center would not have taken place today. This march today is called pride and yes, we can be proud of Curaçao. So today, let’s proudly celebrate the journey and the progress. Let’s celebrate Curaçao as a community where the beauty of DIVERSITY reigns supreme. A multi-colored, multi-cultural, multi-lingual, multi-religious and multi-talented population living together in peace and harmony. Where people from all walks of life are embraced and loved, free to practice their faith, free to express their opinions but also free to love, free to be. I wish you all, a happy pride. Let’s #huntu be proud of our Dushi Kòrsou. BIBA e HENDE, BIBA KÒRSOU!